높이가 120㎝에 이르는 비교적 대형 작품에 속하는 이 종은 종신에 새겨진 명문에 의하면 1700년(강희 39) 조계산 선암사 대종으로 800근의 중량을 들여 개주(改鑄)한 것이라 기록되어 있지만 이 때 새로이 주조된 것으로 이해된다. 특히 김상립(金尙立)의 아들 김수원(金守元), 도편수(都片手) 김성원(金成元), 부편수(副片手) 김효건(金孝建), 김성원의 아우 김섬태(金暹泰) 등 18세기에 활동했던 김상립과 그의 아들 등의 이름이 나열되어 있어 당시 김상립을 중심으로 한 사장계(私匠系)의 활동 상황을 엿볼 수 있는 첫 번째 작품으로 의미가 깊다. 이 종은 종의 형태가 조선후기의 전형을 이루고 있음은 물론, 활기찬 쌍룡뉴와 연곽대, 보살상과 왕실 안녕을 기원하는 문구가 담겨 있는 전패 등 각 부의 문양이 섬세하면서도 전체적으로 조형성을 잘 갖춘 작품이다. 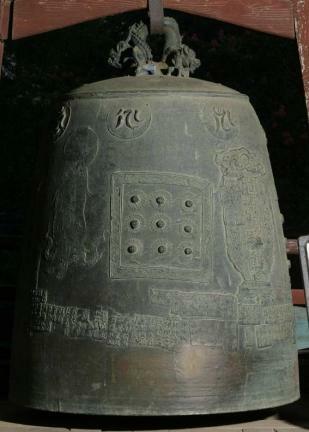 This relatively large temple bell, 120 centimeters in height, is the main bell of Seonamsa Temple. According to an inscription engraved on its body, the bell was recast with 800 geun (one geun equals 600 grams) of bronze in 1700, but it is believed the bell was in fact newly made at this time. The inscription also lists the names of bell casters and carpenters who were active in the 18th century, such as Kim Sang-rip and his son, Kim Su-won; head carpenter Kim Seong-won and his younger brother, Kim Seom-tae, and assistant head carpenter Kim Su-won. The bell is shaped in the typical late Joseon style. It is aesthetically outstanding featuring an energetic twin-dragon hook, refined lotus panels and bodhisattva images, and the tablet containing the Chinese character ‘殿,’ which suggests wishes for the prosperity of the royal family.